Sankofa Stories: The Vision, Experiences and More – Help us help the youth of the Virgin Islands remember and respect themselves, their community and their history through Cultural Education! Sankofa (main symbol seen as our logo to the left) can mean either the word in the Akan language of Ghana that translates in English to “go back and take” (san=return, ko=go, fa= take) or the Adinkra symbols seen as our logo(s). It symbolizes one taking from the past what is good and bringing it into the present in order to make positive progress through the benevolent use of knowledge. 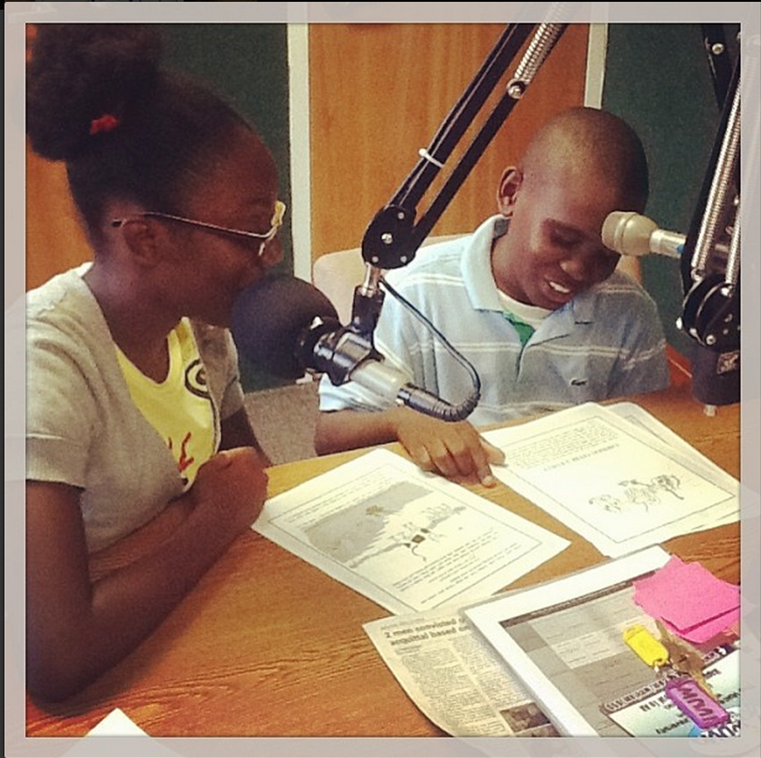 What is the Sankofa Saturdays Youth Radio Program? 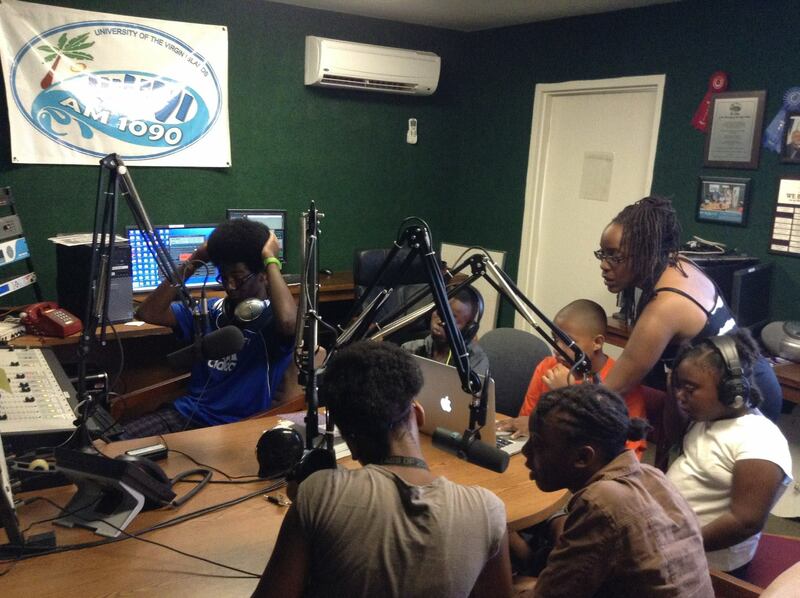 A weekly LIVE youth radio program sharing music, history, local artists, cultural and arts events often co-hosted by youth with the intention of teaching youth radio production as a means of public service through advertising, marketing and promoting digital e-learning. Co-hosted by students from Sankofa Saturdays as well as the Environmental Rangers LIVE in our WUVI Studio here at the University of the Virgin Islands. Narrative/letter from the Founding Director of our current situation, goals etc. As usual, we always need volunteers from the village in any of these areas as well as and as our foundation even more importantly just to help monitor the children being children. This is where we pass on our cultural values and teach them to respect themselves and each other through peaceful and productive communication and collaboration. In any situation, this is where I’m most concerned. Yes they’ve gained the experiences, learned the skills and the information, but if they are better people from the experience then we know we’ve done what we set out to do. Our job is to raise the humanity in each you through paying attention and listening to who they are, what they’re going through and how we can help them channel their feelings into creative ways of expression and helping others. In reality, we’ve greatly downsized and would be better able to accomplish our goals and serve more youth, if we had more help. We even need help to find help…again, not for lack of knowing where to ask, but lack of having the time to focus on it more while managing our own busy lives. We remain quietly consistent and work with what we have. Ideas and experiences are always available, but we need to recruit volunteers from any retired educators, therapists or professionals in the fields we utilize. Any willing persons willing to assist with transportation so we can safely get students to and from the station or special location. I use to write grants, but honestly haven’t written one in a long time, not that I don’t think there’s funding support out there, but more importantly was finding the kind of help that wanted to be there even without the money involved, so that when I do start writing for support again, I’ll be supporting people who are dependable because they share the vision, our mission and truly understand the fundamental goals. Our youth are so talented, so capable and so willing… But they need our support more now than ever in this fast paced moving world. They need us to slow it down for them and help them remember why we’re here and learn who they are. There’s a lot of work to be done to help protect them from so many of the distractions that are out there preventing them from being their best selves. Together, it’s our job to find, no create a way to get it done for them, using what we’ve learned from our past experiences and bringing those lessons and at knowledge into our present so that we can help to ensure better futures for them, for us and for the world around us. Sankofa Saturdays is just one way. It’s not the only way, but it’s the way we choose to help humanity in each other and for us all. We’re creating a template that can work anywhere so that we can do this anywhere on the globe in any community to help them preserve their culture and traditions. Help us help the youth of the Virgin Islands remember and respect themselves and their community through Cultural Education! Passing on the torch of culture bearing and preserving (traditions and values) through documenting experiences in the arts, cultural education, and community service. The shows are posted unedited on our SoundCloud account for archiving the radio. We have the intention of sharing YouTube versions eventually which would include multi-media collages of video clips, pictures and audio etc. Donate via PayPal at info@SankofaSaturdays.com if you can only assist that way, but money isn’t the greatest need, though it would make it easier for us to get more help and support those who do. Thank you for even reading this far. We appreciate the time and energy you’ve shared to be one with our thought and mission. Please excuse our site as we work mainly offline to recover and rebuild from the disruption(s) of Hurricanes Irma and Maria. We are seeking volunteers and students to train in various areas, especially media and technology. #KwanzaaEve at 7 p.m., Tuesday, Dec. 25, at the University of the Virgin Islands to watch The Black Candle film on Kwanzaa by M. K. Asante, Jr.
-26th: 6 p.m. at Wesley Methodist Church Educational Complex in Tutu (East), St. Thomas | African Diaspora Youth Development Foundation Inc.
Also, follow the KWANZAA365 Facebook page and 2018 Facebook Event. KWANZAA365: Not just a Holiday; Nguzo Saba as a Way of Life! Collectively reuniting the village for our global best interest… individuals, agencies and organizations through community event organizing, media relations and youth outreach through Sankofa Saturdays Youth Cultural Education Initiative. Passing on the torch of culture bearing and preserving (traditions and values) through experiences in the arts, cultural education and community service. Help us help the youth of the Virgin Islands remember and respect themselves and their community through Cultural Education! Naim, Majestik, Kelley and Nykel spoke about their latest experiences this week at the 24th Annual St. John Folklife Festival at the Annaberg Ruins where Majestik performed with her school choir and Naim went on her own as an observer. Nykel shared just a little about his experience preparing for the Junior Calypso competition which takes place annually during our Carnival season. Benjamin worked silently in the background on learning Adobe Audition to edit the interview of Carib Tribe hosted by Dr. Chenzira Davis Kahina on VICCC365 (the UVI Virgin Islands and Caribbean Culture Center radio show). This week’s show is entirely unscripted so hear first hand, from the mouths of babes themselves, how the students communicate with each other, what they feel about out-of-school activities which are teaching them so much… without the need of textbooks, classrooms and buildings. Skills worked on included research (online), presentation skills, code switching, the realities of youth peer pressure, recalling information for sharing, summarization, collaboration, team building, taking turns, culture, history, reading comprehension, interpersonal communication, and more. Some of the topics included the V.I. National Park 24th Annual Folk-Life Festival, Addelita Cancryn Jr. High School’s New Saturday Swimming class and preparation for this upcoming VI Carnival‘s Junior Calypso Tent. “In celebration of Black History Month, Virgin Islands National Park and the Friends of Virgin Islands National Park have partnered to present the 24th Annual Folk-Life Festival. The festival is scheduled for 10 a.m. to 3 p.m. on Feb. 26 and 27, at the Annaberg Sugar Plantation Ruins on St John. Discussion will be recorded and shared during the weekly radio program 4-6pm on http://www.WUVI.am here on Saturdays following the documentaries. Audio will also be available on our SoundCloud.com/SankofaSaturdays site. Friday, Dec 26 – Umoja (UNITY) – 6 p.m. St. John Alpha Kappa Alpha Sorority Inc. Franklin Powell Ballpark – 7 p.m., Wesley Methodist Church in Tutu. African Diaspora Youth Development Foundation presents their annual Kwanzaa Program with music by Echo People, Guest Speakers, African Marketplace, good food and Kwanzaa activities. – 5 – 6 p.m.; Kwanzaa Education & Music Radio Program on WUVI AM 1090, presented by KWANZAA365 and Sankofa Saturdays Youth Cultural Education Initiative. – 6:30 p.m.; Arian’s Restaurant. Pan-Afrikan Support Group and Environmental Rangers present their annual Kwanzaa Gathering and Educational Program. Sunday, Dec 28 – Ujima (COLLECTIVE WORK & RESPONSIBILITY) – 10 a.m.; We Grow Food Farmer’s Market at the Bordeaux Farmers & Agricultural Grounds. A Kwanzaa program will start at 2 p.m. highlighting the principle of Ujima with poetry, youth activities, music and other cultural education and entertainment. Farmers produce, arts, crafts, wholesome meals and refreshments will be available in the African Marketplace. Wednesday, Dec 31 – Kuumba (CREATIVITY) – Sunrise/Sunset; The Blake Family hosts sunrise and sunset Hatha Yoga at Brewers Beach. Thursday, Jan 1, 2015 – Imani (FAITH) – Midday/Early Afternoon; United Communities Kwanzaa Potluck at Brewers Beach. Bring a natural dish or seasonal refreshment and a cultural or literary gift for the Kwanzaa Zawadi Exchange. #KWANZAA365 More than just a Holiday; Nguzo Saba as a Way of Life! On this edition of Sankofa Saturdays Youth Radio Show… We always play our theme song, ‘We are the Children of the Future,” by local musicians A.R. and Ganjanero along with songs from Reginald Cyntje, Bambu Station, Pressure, Prince Short Shirt and Niyorah. 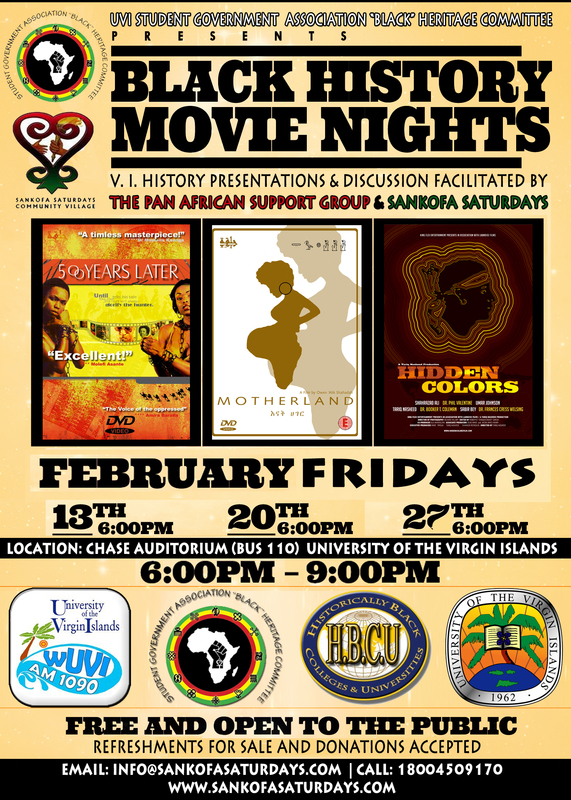 A United Virgin Islands Cultural Education Initiative for the youth, by the youth and about youth with related topics(often brought to us by KWANZAA365, the UVI Virgin Islands Caribbean Cultural Center as well as the Department of Education’s Division of Cultural Education).